Welcome to Camping Al Lago Ledro. 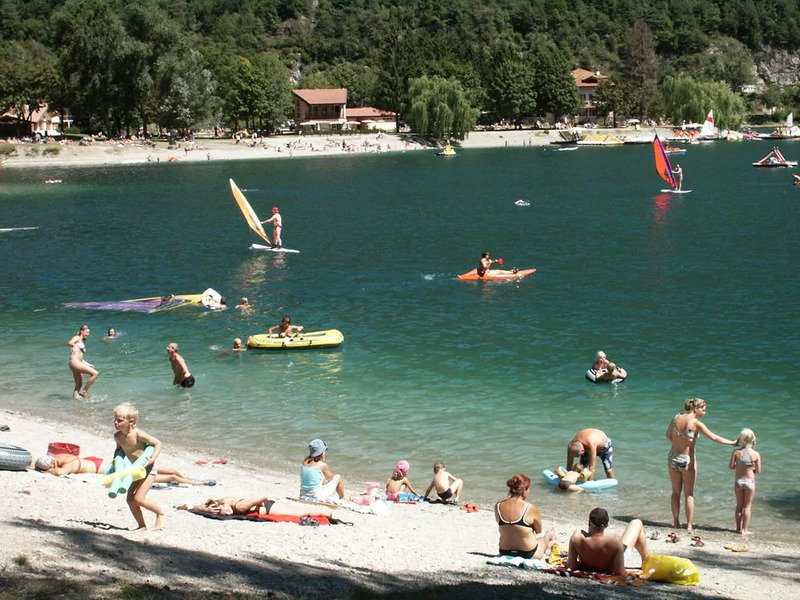 The Camping al Lago is situated on the shores of the Lake of Ledro one the clearest and most pleasant lakes in the whole Europe; the lake stays at 600 metres of altitude, in an unpulloted environment of unconparable beauty. The familiar management (the camping-side is run by Penner brothers) has been privileging cleanness and quietness for more than thirty years. The Camping Al Lago is an ideal spot to find quiet and to relax, with its nice beach where you can sunbathe and the lovely water where you can swim sail and wind-sur and with the playground for your children; all this is surrounded by green woods and nature, by blue water for wonderful fishing and easy paths for excursions. It's the right place for mountain-bikers, too; they can find here particular and well marked journes, a very paradise of this sport both for simple amateurs and professionals. The camping-side is about half a kilometer far from the village, where you can get anything for leisure-time; tennis-court, bowls minigolf-links, horsemanship, life-routers, craf-rental, beach volley. In the camping-side office you are daily informed of the entertainment programs in the whole valley, from the music-concert to the village festivals and from the varians exhibitions to the balls. The managers also organize groups within the camping-side to take part in the different sports contests. The Camping Al Lago staff knows the English, Dutch and German language. (Camping Al Lago Ledro campings).